Our summers are long and hot and dry, and restrictions on water-use are becoming the norm. Come see / explore / learn about a “new” old landscaping technique that we’re trying at the farm to help grow food in these conditions: swales & berms. 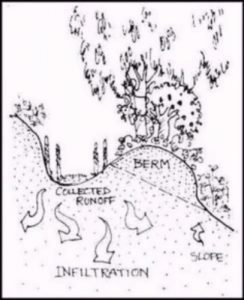 applications of swales and berms for all garden sizes. There will be a food-for-thought post-workshop discussion from 12 – 1 pm for those who wish to stay, so bring a lunch, and all your visions and dreams. Cost: 30$ Limited space available, reserve your spot now! This is a RSVP event. Your spot will be guaranteed upon full payment. Thank you! @ InishOge Farm, this Sunday, August 9th 2015. Responding to the changing needs of people in a changing world! * an earth meditation and drum circle in the meadow to finish off the day. Please join us for part of it, all of it, any of it!! Full details online here. There’s very limited parking on site, so please walk, bike, carpool or park your car on neighbouring roads. stay as long as you can. BYOB and chips afterwards when it’s all finished. InishOge will supply the tools on the day. You and your family are invited to gather, break bread and enjoy quality time with friends old and new at Transition Sooke’s first summer picnic. Arrive in the late morning for a pre-picnic earthworks-swale building learning experience (BYO shovel). Or join us in the early afternoon with a potluck dish to share and family members at your side. Lunch will be followed by games and activities for kids and adults along with music, lively conversation, catnaps in the shade and walks around this magnificent piece of Sooke’s historic farmbelt. Bonus: Join our hosts Steve, Mary, Chloe and Finn on tours of their newly completed, custom-built farmhouse and discover its Transition-friendly secrets. Please walk or bike (this is a Transition picnic, after all 🙂 We’re offering a prize for the most creative mode of human-powered transportation! Parking at the farm is limited, so please leave your car in the surrounding neighbourhood (at or near the Municipal Hall, for instance), then enjoy the short stroll. Car poolers can drop passengers off at the farm gate. If you do need a ride, we’ll be operating a shuttle service from Evergreen Mall between 12:30 and 1 p.m., then make return trips once the picnic ends in the late afternoon. Please let us know in advance if you’ll be hitching a ride with our drivers. Please RSVP by reply email and let us know the names of family members who’ll be joining you. 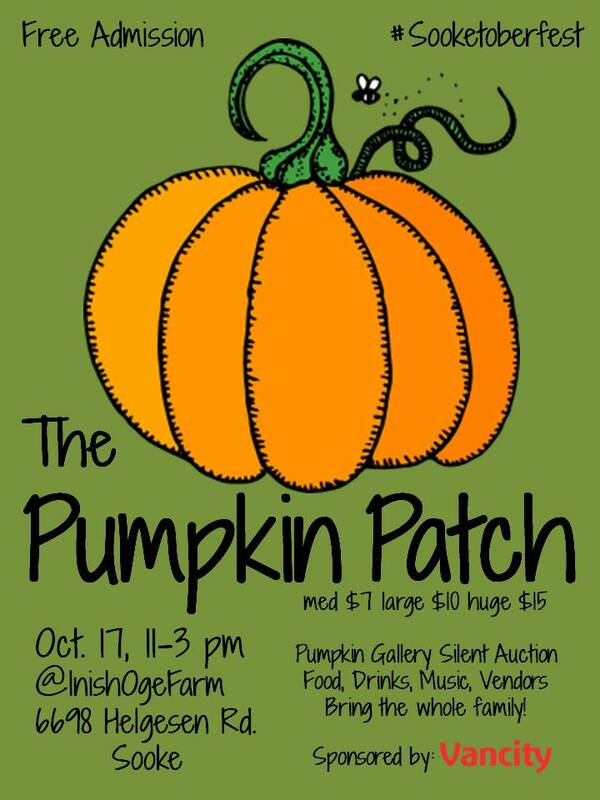 Capacity is somewhat limited at the farm, so please reply ASAP for planning purposes. 11 a.m. “Stay Calm and Swale on Contour,” a chance to take part in and learn about a permaculture land-forming and irrigation project in progress at the farm. Develop skills you can apply to your own garden by digging interconnecting channels and swales to feed the farm’s orchard. Please bring your own shovel! 1 p.m. to 2 p.m. Potluck picnic. Bring a dish to share along with your own plates, mugs, cutlery and picnic blankets. Our intention is a zero-waste event, so please pack out whatever can’t be recycled or composted. 2 p.m. onwards. Let the games begin! Human knot, egg & spoon and three-legged races, music jams and, for the kids, a scavenger hunt and craft-making project with found materials. There will be prizes! (locally made and grown ones, sourced from the Sooke Country Market). Please bring an instrument and/or your singing voice. A prize will be presented for the day’s most original instrument. * Admission is free, though we’d appreciate a twonie or two to help with our insurance costs. * Children are most welcome with parental supervision. No dogs in respect to the resident critters. * No alcohol please at this family event. * If it rains: Cancelled if persistent, carries on if just “misty.” Tarps will be hung amidst the trees, so we’ll have cover (and shade if it’s as hot and sunny as we hope). Please join us for what promises to be a memorable, relaxed and warmly communal gathering of the local Transition clans. 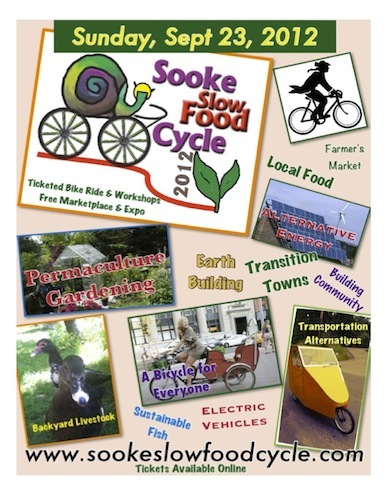 The second annual Sooke Slow Food Cycle tour is an initiative of the Sooke Transition Town Society and the Juan de Fuca Cycling Coalition. The non-profit, volunteer-run community event is designed to inspire, educate and entertain anyone interested in creating greener, more sustainable home, life and workstyles. i) the Sooke Slow Food Cycle tour, a ticketed ($21 per person/$42 for family groups of any size) 33km bike tour of Sooke featuring 18 stops of interest. ii) the Collective Transition: Sustainability Expo & Marketplace, a mini Transition Town village for the day at Edward Milne Community School that’s open and accessible to all either free or by small donation. A portion of all proceeds is slated for the Sooke Bike Skills Park and the local Seedy Saturday heritage seed-saving project. iii) Harvest feast at Sunriver Community Garden. A separate ticketed event ($20/adult; $10 children) limited to 200 tickets; contact info@sookefoodchi.ca. Come visit us Saturday, October 9th, 2011 10-4pm – peddle down the drive and tour the farm; learn about natural cob building, clay ovens, composting toilets, and solar power. Tours start 10:30am. 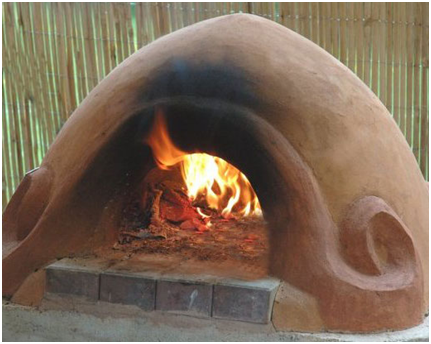 Fresh clay oven baked pizza and farm produce for sale! Come explore the “ways of the clay” as we build a cob oven on our farm in Sooke, with Holger Laerd, natural builder and long time Sookie.